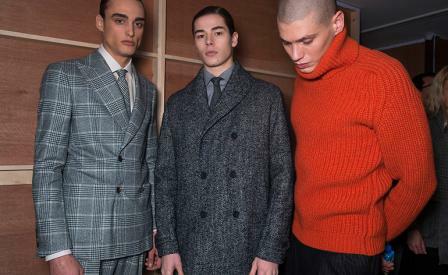 Mood board: To a playlist of abrupt sound bites ranging from contemporary rap to jazz, a myriad of versions of the tailored suit in colours from grey to turquoise made an appearance at Richard James. They illustrated the collection’s ‘Chains + Cranes’ theme, which took inspiration from the bustling London docks in the mid 1930s. Best in show: Savile Row tailor Richard James excels at suiting combined with casual wear, and especially when silhouettes are integrated. For example fluid polo necks worn underneath sharp blazers, or a bulky knit with a scarf attached that perfectly coordinated with dark plum velvet suits. Finishing touches: A novelty hair-do in many Mayfair social circles is a rarity to be sure, but Richard James sent out more than one model sporting the controversial man-bun. In the spirit of street-savvy dockworkers turned casual British gentlemen, it surely didn’t feel out of place.